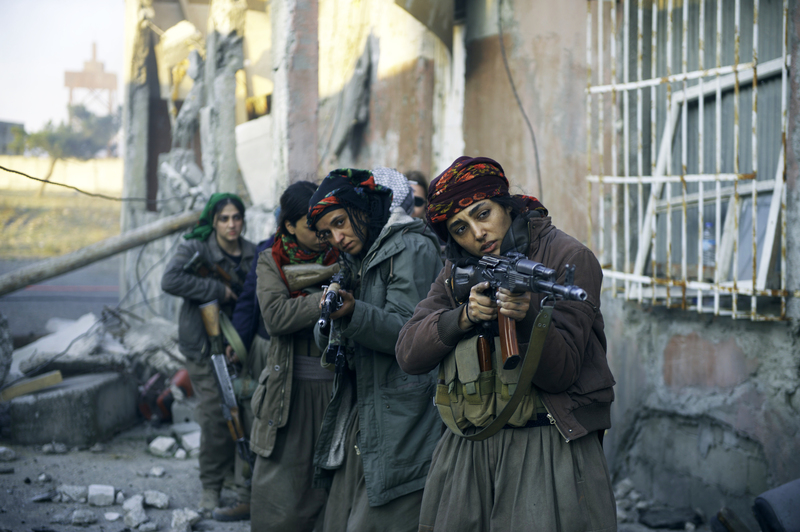 Girls of the Sun presents the horrors of war as seen through the eyes of Kurdish women soldiers, and those of filmmaker Eva Husson. The French writer/director brought her first film Bang Gang (A Modern Love Story) to TIFF’s Platform program in 2015, where it shocked and impressed viewers with its frank depiction of teenage life. This new feature, her second, rattles the senses in a different manner. Based on a true story, Girls of the Sun stars Iran’s Golshifteh Farahani (Paterson) and France’s Emmanuelle Bercot (My King) in a drama about an all-female battalion seeking to retake a Kurdish town once held by militants for Daesh, also known as ISIS. Farahani is Bahar, a woman seeking justice (and also revenge) by fighting the men who enslaved her sexually and took away her son. When first met, Mathilde is in a hotel room, grieving her husband, also a journalist, who was recently killed in Libya. She and Bahar have much in common, and that includes fighting the patriarchy of supposed allies who can’t believe or countenance the sight of women fighting: “What are you doing in this hell?” someone asks. This film, which premiered in competition at Cannes 2018, certainly does believe. It doesn’t stint on war-movie tropes and cliché-filled speeches, sometimes to its detriment. It fares better in recognizing the humanity and determination of the female soldiers.